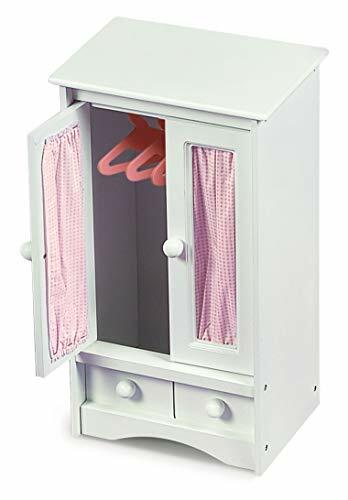 Keep your doll's clothes safe and tidy in Badger Basket’s Doll Armoire with Three Hangers! Fabric-accented doors open to a clothes rack for careful storage of your little friend’s beautiful wardrobe. Faux drawer front with knobs on the bottom contributes to the classy design. Includes three hangers for special dresses, costumes, and outfits. Grip tape latches keep doors closed. Top surface is a nice place to keep your doll’s hairbrush and hat. Solid panel construction keeps all your stuff inside – nothing falls out the back, sides, or bottom. Realistic look of the hangers adds to the fun. Open area in center of each hanger is great for hanging belts, scarves, or pants. For dolls up to 22 inches. 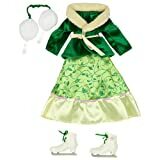 Fits 18 inch dolls such as American Girl, My Life As, Madame Alexander, and Our Generation; and also fits 15 inch American Girl Bitty Baby dolls and 14.5 inch American Girl WellieWishers dolls. Doll Armoire is made of wood and engineered wood. Hangers are engineered wood. Fabric is 100% Polyester. Overall assembled dimensions 12.5 inches L x 8.5 inches W x 21.5 inches H. All measurements approximate. Spot clean the fabric as needed and air dry. Wipe the frame and hangers clean as needed with a lightly dampened cloth and dry thoroughly. Adult assembly required. Illustrated instructions included. For children from three years old and up. This item is to be used with dolls only and is never to be used with real infants or pets. /!\ WARNING: CHOKING HAZARD - Small parts. Not for children under 3 yrs. Product complies with all currently applicable safety standards. Product includes a limited warranty of 30 Days Parts to the original purchaser. Doll and doll clothes/accessories not included. Product may vary slightly from shown and described. Props/accessories shown are for illustration purposes only and are not included with the product. Actual color/finish may vary slightly from screen display. This item ships in its original carton which may include a product photo.